Pilar and Lisette talk about teambuilding as an ongoing process and suggests some things you can do to strengthen your virtual team. 00:30 Pilar is thinking of creating an episode about the podcasts she listens to. For now, she recommends this episode from the Fizzle show. How to Deal With a Job You Loathe. 04:45 Teambuilding as a process and how the VIRTUAL not Distant model supports teambuilding in virtual teams. 18:05 How to get in touch with LIsette and Pilar. 18:30 Pilar and Lisette talk about the weather - can you believe it? 19:40 Lisette talks about her Work Together Anywhere Learning Camp in Stockholm with Knowit. 23:05 What do we mean by teambuilding? It's not just a one-off activity but an ongoing process. Is it easier to find time to spend time together online, in virtual teams than organising quality face to face time in colocated ones? 29:20 Making room for teambuilding - for intuition and things that happen organically in the co-located space. Knowing how to talk to each other when we have a problem. Sometimes it's sharing vulnerability that it allows us to get to know each other better. Sharing personal information vs being personable and allow yourself to be known. Have a group chat tool. Have a channel for non-work related conversations - check out the episode on Onboarding. Have a social network, like Yammer, if you want have longer and multiple conversations. Create Personal Maps and revisit them after you update them, every few months. Revisit your teambuilding activities and tools when the team changes, eg when someone joins. Your team dynamics will change depending on the work arrangements in your team. Try tools out but don't overburden your team. Can we use moaning to build our team? 48:55 Lisette's experience with a great virtual manager. Who's responsible for teambuilding? Everyone! 53: 40 Value stories - values in virtual teams drive how we make decisions together. Lisette tells a great Jurgen story. Leading by example. Teambuilding is also about paying attention to the individual and building connections between individuals. Has the word "teambuilding" lost its meaning? Lisette talks about some activities to accelerate teambuilding. What's the point of doing them? Online meetings are an opportunity for teambuilding. We need to feel safe but challenged. Hello, I’m happy to be back in London recording this introduction to episode 35 of the 21st Century Work Life podcast – and I’m trying to find different ways of introducing the episode number without it clashing with the “21st” in the podcast title, so any tips, do let me know. And as the intro mentioned, today’s episode includes virtual coffee with my co-host, the wonderful Lisette Sutherland from Collaboration Superpowers – there’s another podcast to add to your list. I’m actually listening to so many podcasts at the moment that I want to share with you that I’m thinking of creating an episode just with podcast recommendations for you, so maybe you can get in touch if you have a podcast to recommend? Either along the lines of this one – 21st century work life or virtual teams; or anything else, you never know what might be of interest to someone else. But before I think of creating that episode, I want to recommend one particular episode from the Fizzle show. Fizzle is a community for entrepreneurs, run by three guys and a gal now. I’m not part of that community but I do listen to almost every podcast they create. They give very sound advice, they’re really down to earth and have a sense of humour I really like and the episode I particularly wanted to recommend is How to Deal With a Job You Loathe., episode number 114. Two reasons why I recommend it: one, I really liked it, it didn’t say things like, if you hate your job go and find your passion – instead the hosts acknowledged that it’s not always possible to leave your job because you might need the money, quite important for survival, and they suggest other things you can do to make life more bearable – and they have some interesting personal stories too. The other reason I want to recommend it it’s because this is not something we cover in this podcast – the guests who come on the show really love, or at least are happy, with what they’re doing and Lisette and I, well… Lisette has had some terrible experiences but myself, being freelanced, I’ve always been able to escape or avoid jobs I didn’t like – lluckily I like doing all sorts of stuff, so that makes life easier. So, the Fizzle Show if you want to check it out on your podcast app, or go to fizzle.co Let me know if you do check out the show, tell me what you think. In collocated teams, the informal aspect of teambuilding can happen spontaneously and sporadically – and the informal “getting to know you” stuff is important because it builds trust, and if we trust each other, we’re more likely to ask for help, offer help etc… But in virtual teams, we need to be more deliberate about this. 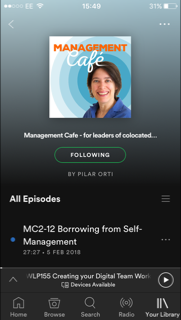 So, if you listen to this podcast regularly, you’ll know that I’ve got my little model of Virtual, not Distant, where I look at seven aspects of team development, and while I was looking at the different things each letter in Virtual addresses, I noticed I never use the word teambuilding. That’s because it’s embedded in the seven letters of VIRTUAL – Visibility, you can see how making each other available and making our work visible can help to strengthen the team; Identity, team identity – if we don’t have a team identity, we don’t know what team we’re building; Results, by working towards results, we come together as a team; trust – I’ve already talked about this; upgrowth, by which I mean learning together, for me, is one of the most important and overlooked aspects of teambuilding. Learning together is a powerful experience: in learning, you make yourself a bit (or a lot) vulnerable; you are on high alert; you discover things about yourself etc And if you’re doing this with someone else, the experience can be a bonding one – as well as a very practical one. So setting up learning experiences, can really help to build your team. As I mentioned, this aspect is often overlooked, so much so, that even Lisette and I didn’t bring it up during our conversation. Hm. Moving onto the last two letters of the VIRTUAL not distant model, A is for Appreciation, well, it goes without saying that we’d rather be part of a team where we feel appreciated, so again, we need to be deliberate with this and finally Leadership, which should not just come from the person officially in charge, but there should be enough room for people to step up on different occasions, not necessarily formally but there should be room for people to take the initiative. So, all easier said than done, as always, but I hope my chat with Lisette will be of help or at least ignite one little spark of inspiration.